Review of De Proef Broederlijke Liefde | Beer Apprentice - Craft Beer News, Reviews, Interviews and Info. Welcome back to another craft beer review everyone. Thanks for stopping in. 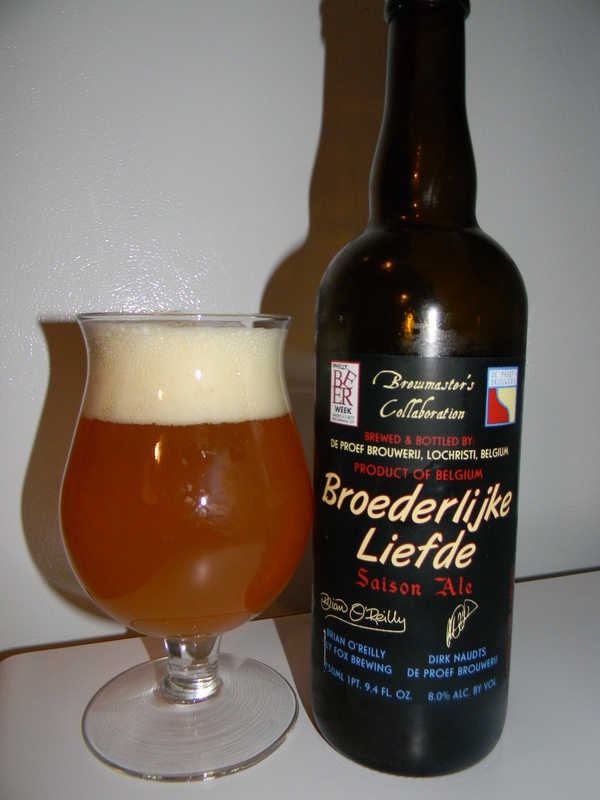 For today’s tasting pleasure we are going to be trying the Broederlijke Liefde brewed by De Proefbrouwerij (bvba Andelot) located in Lochristi-Hijfte, Belgium. I’ve only had one other beer from De Proef and that was the Flemish Primitive Wild Ale (Surly Bird) and I really liked it, so I’m eager to see if this one is just as well made. This was a collaboration brew created with Sly Fox Brewing for Philly Beer Week. The website, proefbrouwerij.com, doesn’t reveal any info regarding this beer, so I checked on ratebeer.com and found this. Broederlijke Liefde (Brotherly Love) is a slightly higher gravity interpretation of the saison style. It is fermented with two yeasts – a classic saison yeast as well as brettanomyces from an original gravity of 1066 (16.5 plato). These yeasts yield a dry and slightly spicy ale with a strong hint of farmhouse character that will continue to develop with age. The use of Target and Styrian Golding hops at 37 IBUs add floral aromatics and a balancing bitterness. This beer came in a 25.4 oz. bottle and it had an ABV of 8.0%. It poured a very hazy, orange color with a greatly sized white, soft, fluffy and soapy crown. The retention time was magnificent and it also left behind some choice, patchy lacing as it finally did settle back into the liquid. The nose presented a Brettanomyces “bug” type of character. A lot of good barnyard funk. Very yeasty with undertones of lemongrass and sweet orange peel. Hints of coriander and pepper type spices too. A favorable and welcomed earthy waft started to show itself after it warmed. A very nice smelling brew in my opinion. The flavor let loose with more of the Bretty funk. It seemed to be of a suitable medium strength. The lemongrass and orange citrus held true while a yeasty and white bread savor added some “roundness”. The spicy pepper “bite” was a touch more intense and the earthiness only complimented and didn’t dominant in any way. The mouthfeel was medium bodied. Dry, crisp, kind of spritzy and bitey. The carbonation were a bit more on the livelier side and a very minor amount of warmth was felt from the combination of the pepper and the alcohol. A superb amount of flavor was left covering the palate after each sip as well. I tell ya. I thought this was a very, very, very nice beer. I wish I would have picked up another bottle. I love the Brettanomyces aspects. The harmony and balance were exceptional as no one profile outshone the other. The drinkability was outstanding as well, so in that regard this beverage would pair super well with the Spring and Summer season. I’d definitely recommend giving the De Proef Broederlijke Liefde a try if you can obtain a bottle. If you like the funky Saison style I have no doubt that you would love this one.